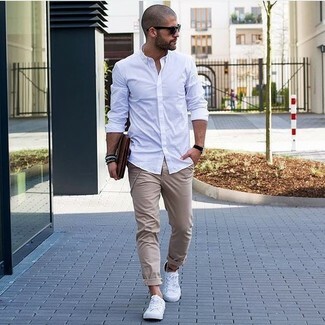 We all ensemble for comfort when it comes to dressing up, and this combination of a white long sleeve shirt and Brioni round frame sunglasses from farfetch.com is a great illustration of that. You could perhaps get a little creative in the footwear department and lift up your look with white low top sneakers. Wear a brown shearling jacket with black sunglasses if you're on a mission for an outfit idea for when you want to look casually cool. Kick up the cool of your look by rounding it off with brown leather casual boots. 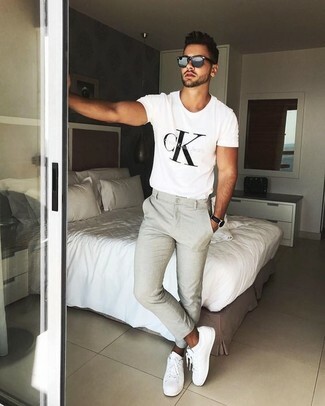 If you want to look cool and remain cosy, choose a white and black print crew-neck t-shirt and Brioni round frame sunglasses from farfetch.com. You could perhaps get a little creative in the footwear department and dress up your look with white leather low top sneakers. If you're a fan of relaxed dressing when it comes to your personal style, you'll love this stylish combination of a tan wool blazer and Brioni round frame sunglasses from farfetch.com. You could perhaps get a little creative in the shoe department and elevate your outfit with black leather double monks. Rock a brown wool blazer with Brioni round frame sunglasses for a laid-back yet fashion-forward outfit. Dress up your look with red suede boat shoes. Consider pairing a red long sleeve shirt with Brioni black sunglasses for equally dapper and easy-to-wear outfit. A pair of white athletic shoes completes this outfit quite well. If you prefer practicality dressing when it comes to fashion, you'll love this easy pairing of a navy plaid blazer and Brioni round frame sunglasses. Amp up the cool of your look by completing it with grey suede loafers. 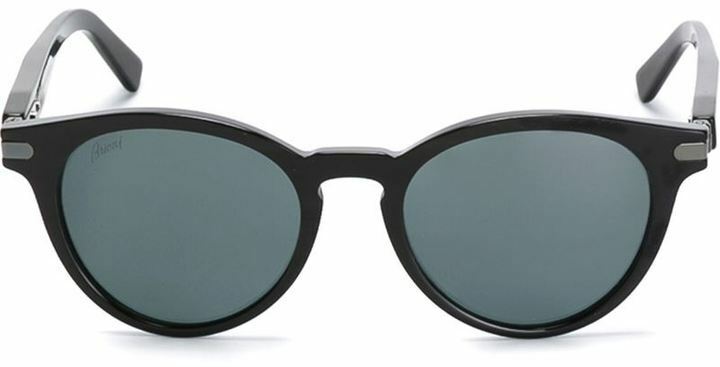 Pair a black field jacket with Brioni round frame sunglasses for a laid-back yet fashion-forward outfit. Turn your sartorial beast mode on and opt for a pair of grey suede derby shoes. 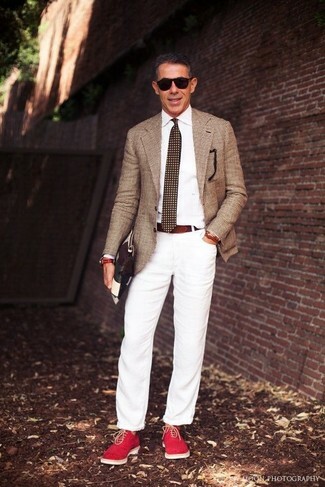 Consider wearing a brown print short sleeve shirt and Brioni black sunglasses for a casual-cool vibe. Got bored with this getup? Enter white canvas low top sneakers to change things up a bit.